Miniata was brought into Australia round about 1989 by Marilyn O’Dowd. I had it about then and lost it. 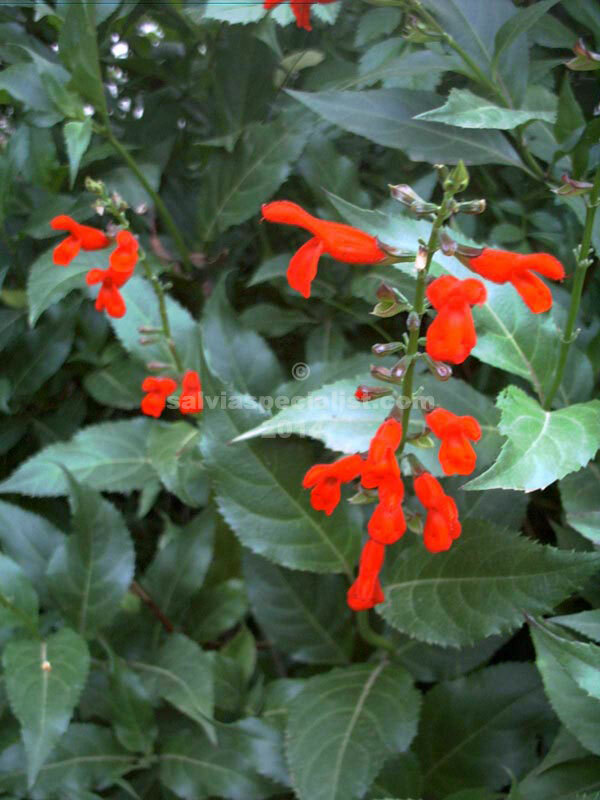 About 5 years later I was asked to identify a salvia and was pleased to find it was miniata. Possibly I have now had it planted in the same place for about 20 years and am thinking of moving it. I am so used to having a big healthy bush and take it for granted but starting off again from a small piece I might have to keep my eye on it. I will plant it again in shade as it would be more useful than its present rather prime site with a lot of sun where extreme heat and sun could wilt the leaves. 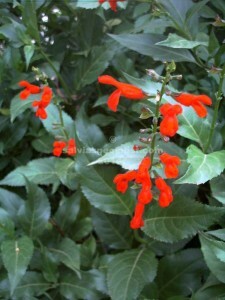 Miniata doesn’t like frost and will respond to cold by turning its leaves purple as so many salvias do. I am sure it has its scarlet flowers year round in sub tropical areas similar to its home in Mexico. The flowers have a real luminous quality which get your attention. It can be grown in shade. Miniata has fairly large foliage that is smooth and dark green. It will layer if bent over or extends its area with multiple canes. I have it jostling for space with a few other salvia species all around 2m high.